This week I’ve got a crazy work schedule, but I am finding time to squeeze in a little beadwork here and there. It seems as if the momentum I had at the beginning of the year has fizzled out, but the plan to make use of my favorite beads and techniques is still in motion – even if it’s a little slower than I would like. I’m trying not to let too many ideas crowd in and derail my motivation. One bead or project at a time is just the way to do it. I’m just finishing up the new bone lariat, and then I decided it was time to make a new bugle cuff. I stocked up on a few favorite colors in Czech bugles a little while ago, specifically to make square stitch bracelets, and I thought it was about time I actually started using them. I’m really looking forward to trying out this satin blue color – I just have to decide on a pattern for the black and beige. Trying out new combinations of bead colors every month is a great way to exercise creative muscles and experiment with palettes, but it’s not often that I actually get to use any of the concoctions I come up with. Right now I am working on a lariat inspired by a palette from last year, and it’s working out so nicely that I wanted to try again and find a great palette for some beads I want to use up soon. Although I want to make use of all the great things in my bead collection this year, I hadn’t intended on actually working through my supplies methodically the way I did during the destash challenge. I was going to go for a more spontaneous inspiration method. Still, I find myself drawn to using up and finally bidding farewell to some older beads, including all of my Toho cubes and triangles. I’ve already started using some of them up, but I needed to explore some palettes for some lovely silver-lined green triangle seed beads. I started with a palette that I knew I’d like right away, with gold freshwater pearls and dark blue lined aqua 11/o’s. The elegance of the gold pearls and the mysterious quality of the blue seed beads blend perfectly with the metallic sheen of the triangles. This palette could be used for both Egyptian and aquatic themes – two of my favorites. Next I went with some bold colors for a spring look. Canary yellow and purplish cobalt iris seed beads add a lot vitality to the dark green triangles. I like the intensity of the yellow with the darker colors, and the way the shimmer on the cobalt makes it all more sophisticated than your basic opaque brights. I think this palette would be perfect for floral designs. For the final palette, I wanted to add another shade of green. I’ve used these emerald triangles before with dark greens and browns for a pine bough effect, and I wanted to see how similar colors would look – and if they could have the same freshness without being too obvious. I used metallic June bug and transparent dark topaz to complete the trio. I’d really like to see this palette in action, and see how the greens play together in an actual pattern, perhaps with a beetle or dragonfly theme. What are you favorite combinations for dark green? Sometimes it’s easy to see when a beader truly loves beads. The adoration comes through instantly in their design choices, and you wish you could just wear them all. 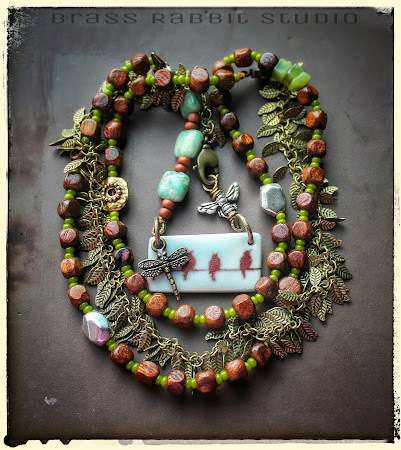 Today’s guest is Mary DeTray of Brass Rabbit Studio, who mixes and matches beads and components in a way that speaks of some serious bead love. Mary: I've been playing with jewelry off and on ever since i was in high school about, 12 years, now. I was never really serious about it till about a year ago, i went through some pretty dark times in my life and the creative process of designing was incredibly therapeutic and healing to me, that's probably why most of my pieces have such an upbeat happy vibe to them, that's what i was searching for in my personal life. Mary: I don't, it was so long ago, it could be anywhere. I do remember my first trip to my local bead shop though, Shipwreck Beads, they were in a much smaller building back then, but they had such an expansive selection that the walls and pillars were literally covered and dripping with strings of beads from floor to ceiling, it was so beautiful to me, I'd spend hours there. Mary: I am in love with handmade components. 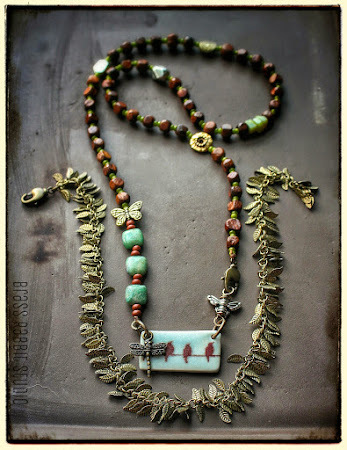 Artisan ceramics are my absolute favorite, enameled pieces, resin pendants and charms, if its handmade i usually love it. 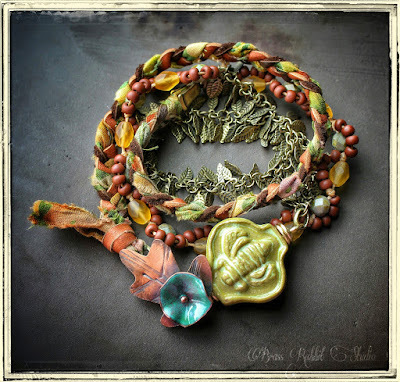 I also often incorporate fibers in my jewelry, leather, batik ribbon, Irish waxed cord, those are my favorites, i love the warm earthy look they give my jewelry. Mary: I normally don't have to look much further than my stash of art beads, the colors, textures and uniqueness of each one has never ceased to spark my imagination. I also have an inspiration board on Pinterest i visit often, its full of my favorite color palettes, they help too when I'm not sure what to do. Mary: Humm, i don't know that i design much differently that the next person, i sit down and begin by pulling beads and components i think would work well together and arrange and rearrange till I'm happy with the overall shape of the piece then i put em all together. I know a lot of designers sketch their designs before they make them, i don't often do that, sometimes an idea may pop into my head while out and about and ill sketch it real quick on my phone so i don't forget about it, but its usually a vague idea, like a unique way to use a component i have, not a full piece. Mary: I really like the convertible necklace i listed the other day. Its so versatile! The fringe chain is removable so u can wear it 3 different ways; with the fringe chain it can be long or doubled and without its perfect pendant length. 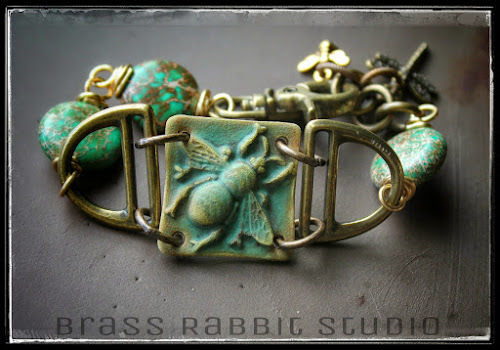 I also really love the green bee bracelet with ceramic focal by Round Rabbit, I like the way the design turned out, this was one of those "ah ha" moments. Mary: Blues and greens have always been my favorite colors, lavender seems to be working its way in too. 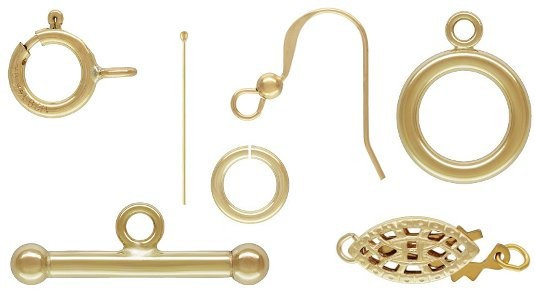 I also favor brass over silver, i like the warm gold and browns it offers. But I'm really trying to branch out and include some deeper reds and oranges, they haven't really ever been my favorite but i do like how vibrant they are. Mary: I've probably listed most of them already but i really like adding something unexpected, a piece never really feels whole to me without that little something extra, like a stray bead in an otherwise consistent stringing pattern, or a little charm in an unexpected place. Mary: Any beader looking to develop new and exciting designs. The artists who inspired me to start designing in the first place were the ones who's pieces were unique and unlike anything I'd seen before. You can see more fabulous jewelry designs in Mary’s Etsy shop, Brass Rabbit Studio. 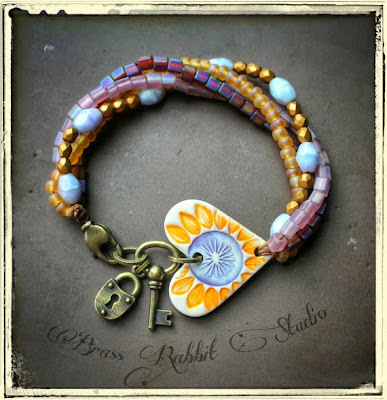 To see new designs, get the scoop on the latest sales, and find monthly giveaways, follow Brass Rabbit Studio on Facebook. 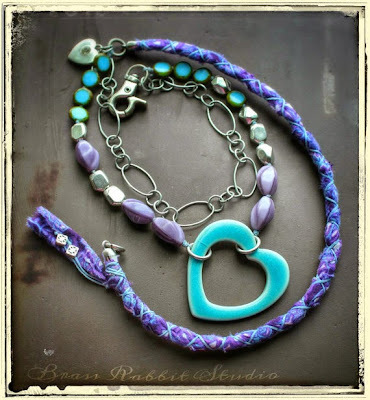 Inspirational Beading readers are invited to save 20% on finished jewelry at Brass Rabbit Studio with coupon code INSPIRE20 until February 17th. I’m a little behind in this week’s update, having lost an entire day of work due to illness. Although I’ve been scrambling to catch up the last couple of days, I have managed to keep projects moving forward. Right now I’m getting down to a new chevron lariat, and it’s coming along rather nicely. I decided it was finally time to try out my new bone tube beads. I had already played with color palettes a bit, so choosing the colors was easy. I threw in some gold pearls at the last minute as well, which should look great in the tassels. Finding a pattern took a little more work. At first I was just going to use black beads in the corners of the chevrons, but I didn’t like how it looked and had to start over. Instead, I’m using a new pattern with alternating rows in the center of the chain. The possibilities for adapting this stitch are still pretty exciting. I also managed to dismantle a few of my purged pieces, and got some pretty pendants to re-use. As an added bonus, I was able to keep the beadwork from that particular necklace intact, so I've got a new piece to wear and some extra components at the same time. The new medallion with emerald Toho triangles is still on deck, waiting for me to be a little less distracted so I can finish it. The dragonfly dagger collar I was working on a few weeks ago turned out really nice. The AB finish on most of the beads work so well together, and really enhance the Picasso finish of the daggers. I still have a few of them left, and I’m looking forward to using them again. Tax season is coming up, and since I’m going to be spending a lot of time combing through my bead and jewelry stash, it’s the perfect opportunity to cull some old designs. It’s always hard to let go, or to admit that a piece that I was once proud of isn’t quite up to my current standards. I’ve found, however, that once I’m done I feel pretty good about the process. It’s very refreshing to skim off the bottom and see what’s left. I wasn’t expecting to have a lot of pieces to pull this year, so I was a little surprised by how much beadwork I ended up with in the out pile. I had to really push myself to ditch a few of them, but it came down to how well they fit in with the designs I’ve been making, and the ones I intend to make going forward. What’s different this time around is how many pieces I like enough to keep for myself, rather than just stuffing them in a box to be forgotten. I’m also determined to dismantle quite a few of these designs and salvage some of the more interesting accent beads. My plan is to catch all the seed beads and make soups for future abstract jewelry. I’ve already got a really great idea for next year’s Ugly Necklace Contest entry, and it’s going to require a lot of seed bead colors. These scraps should come in really handy. Looking back on these older designs is really fun. There are some accents and stitches that I was once madly in love with, and I remember using them fondly. It’s also reassuring to think back to the last jewelry purge I did, which had me cringing quite a bit at what I was eliminating. This time I was actually still happy with a lot of the pieces, just not happy enough to keep them around. They’ll make welcome additions to my personal jewelry stash, though a few of them will need some alterations first so they will work with my wardrobe. How often do you critically inventory your jewelry shops? What’s your favorite thing about the process? Wherever the inspiration for a new piece of jewelry begins, chances are it will end with findings – those components that turn a bit of beading into a finished and functional design. Today’s guest is Jen of the online shop Jen’s Findings, which specializes in high quality clasps, earwires, jump rings, headpins and more. Jen: Beading started out as a hobby when I was in high school. When I was in college I started selling necklaces, bracelets and earrings at craft shows for some extra spending money. During this time, a bead shop opened up just a couple of blocks away from where I lived in San Mateo. I was really excited because before it opened I drove to a neighboring town to buy my beading supplies. It turned out the bead store was started by a young man fresh out of college himself. To make the story short, we eventually got married and had a family. Over the years, my husband has gotten into other types of businesses and I've continued to bead as a hobby and sell beading supplies to supplement our family's income. Inspirational Beading: Do you have a favorite material, color, or style to keep in stock? 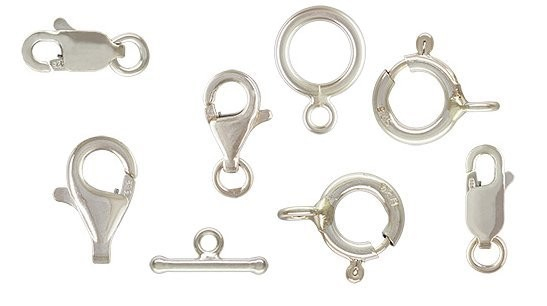 Jen: Well, Jen's Findings is a specialty site in that we only sell jewelry findings and are currently only selling sterling silver and 14k gold filled findings. While I do love the elegant simplicity of the findings, I also love having a pretty filigree clasp at the end of a multi-strand necklace made with beautiful glass or semi-precious beads. To me, a perfect jewelry finding is one that will complement the art that it becoming a part of. Most of the time, the finding is not the focal point, but adds some harmony to the piece, as well as serving a functional aspect of binding components together. Jen: There are staples that beaders seem to always need, such as head pins or lobster claw clasps, but I like to carry with some personality of their own, like our heart clasps or an oval filigree pearl clasp. 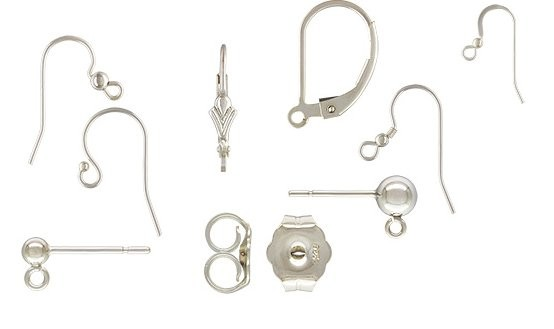 Jen: What sets Jen's Findings apart is that we only sell jewelry findings. We love beads, but we do not sell them. 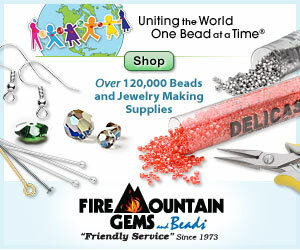 Instead we are striving to be the place beaders go to fulfill their needs for quality jewelry findings. part of a beautiful work of art? Jen: It truly is a wonderful thing. I love that we are able to help people make art. We are a family of beaders (since my daughters and mother-in-law also make jewelry), and we get a thrill seeing our components in finished works. Inspirational Beading: What is your favorite thing to make (or see others make) with your supplies? Jen: I am really into making multi-string necklaces these days. I also like to do wire work and pearl knotting. I am not a talented peyote stitch person, but I do admire what people accomplish with seed beads these days--there are so many creative folks out there! Inspirational Beading: In your opinion, what's the best thing about small supplies shops vs.
Jen: We are nicer! Actually, I think that big retailers provide a good service, but I also think that small suppliers can be competitive to them. Also, we are real jewelry makers and know what beaders' needs are. We got started the business because we genuinely love beads and jewelry making. Also, we are small enough that we can carry limited runs of unique jewelry components made by local artists. Jen: Yes, we are going to expand our inventory to carry more unique jewelry findings, as well as many handmade items like one-of-a-kind clasps. I want to showcase beautiful and unique items. 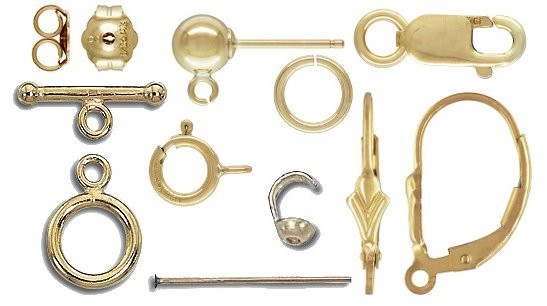 We are also planning to expand our sterling silver and gold-filled findings this year. You can find more beautiful clasps, findings and more at Jen’s Findings, or follow along on Jen’s blog for jewelry ideas and inspirations. It’s always exciting when we discover a pattern hidden within our favorite beading techniques – such as daisies in peyote stitch, or chevrons in herringbone weave. Like a sculptor bringing the statue out of marble, sometimes all we have to do is sit back and let the beads do their magic. One of my favorite pattern discoveries is the shape of tiny hearts within connected lengths of Potawatomi daisy chain. By adding short diagonal rows of color into the beadwork and then doubling up, a row of pretty hearts will emerge. If you’re not already familiar with the Potawatomi chain technique, I highly recommended using it a few times with daisy or vertical stripe patterns to get a feel for the stitch. Once you’re comfortable with the motion of the thread path, it becomes much easier to implement the somewhat lengthy heart pattern. It can be worked with most seed bead sizes, and you’ll need at least two colors to create the pattern. I’ve used red and white here for the full effect, but any palette will look great! On a comfortable length of beading thread, pick up 3 white beads and 2 red. Leaving about a 6 inch tail, stitch up through the 1st white bead picked up and pull snug to form a teardrop shaped cluster. *Pick up 1 white and 1 red bead. Making sure that the tail thread is facing to the left, stitch down through the 1st red bead added in the previous step, and pull snug. Pick up 2 white and 1 red bead, and stitch up through the red bead added in the previous step. Pick up 2 red beads, and stitch down through the 2nd white bead added in the previous step. Pick up 3 white beads, and stitch up through the 2nd red bead added in the previous step. **Pick up 1 red and 1 white bead, and stitch down through the 2nd white bead added in the previous step. Pick up 1 white and 2 red beads, and stitch up through the white bead added in the previous step. Repeat from * until the chain reaches the desired length, and finish with the 1 red and 1 white bead stitch (**) to complete the pattern. Next you will stitch a new chain onto the first, sharing the raised beads at the edge. This will be similar to adding a second row of beadwork to right angle weave or particularly St. Petersburg chain; however, you will stitch from the end of the finished chain, rather than the start, to work a mirror image of the pattern. Cut a new length of beading thread, and pick up 5 white seed beads. Stitch up through the first bead again, and pull snug, leaving a 6 inch tail. Turn the original chain so that the diagonal rows are pointing to the left, as shown. ~Pass through the nearest red bead in the side of the chain and pull snug. Pick up 1 red bead, and stitch down through the 4th white beaded in the starting cluster. Pull snug to form the base of the new chain. Pick up 1 white and 2 red beads. Stitch up through the red bead added in the previous step, and through the nearest red bead in the side of the original chain. Pick up 1 red bead, and stitch down through the 1st red bead added in the previous step. Pick up 2 white and 1 red bead. Stitch up through the red bead just added, and the nearest white bead in the original chain. Pick up 1 white bead, and stitch down through the 2nd white bead added in the previous step. Pick up 3 white beads, and stitch up through the white bead just added. Repeat from ~ to complete the chain. Once you’re familiar with the technique, you’ll be able to see where your next stitch should go without thinking about it. Although in Potawatomi chain the beads are added in clusters, the chain forms a visible pattern of vertical rows with 2 and 3 beads each. The pattern for adding new beads also repeats. When adding 3 beads you will stitch up through the topmost bead of a vertical 2-bead row. When adding 2 beads (or 1 in the second chain) you will stitch down through what will be the lower bead in a new 2-bead row. Adding additional chains is easy – just repeat the pattern, making sure to share beads from the previous chain. For the past few weeks I felt like I was chugging along at a good pace, and then everything seemed to get derailed all at once. My workspace right now looks much the same as it did last week, but hopefully it will be changing very soon. I had added the first few strands of fringe to the new cobalt necklace when I realized I had started them much too short, and they looked a bit weird. I got as far as snipping them all off and then didn’t get a chance to sit down and restart until today. Luckily, I had plenty of time to think it over, and I finally came up with a solution that I like. If all goes well, the fringe will be complete in no time. I haven’t yet decided what to work on next, since I’ve been so tangled up with finding the motivation to finish the cobalt necklace. I’m sure a little inspiration will be forthcoming!